To better prepare aviators for the future fight against a near-peer adversary, the Army is working to improve live, virtual and constructive training environments. 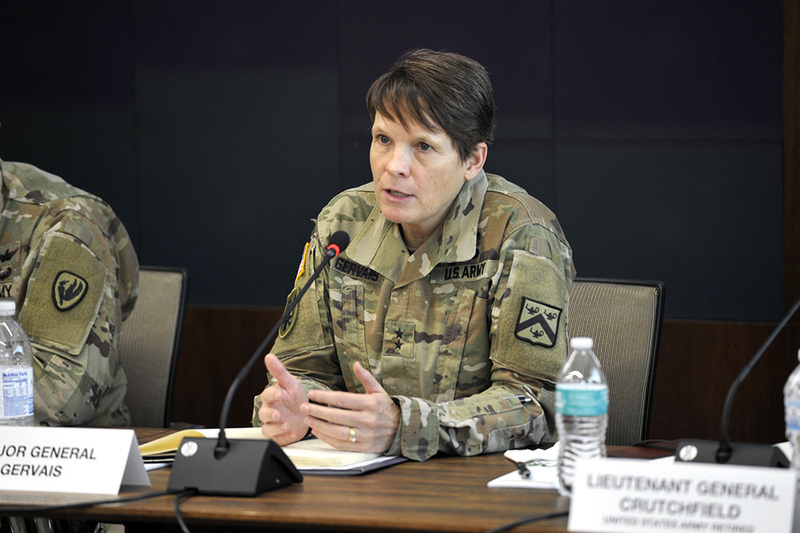 For the past 15 years, the Army has focused on counterinsurgency operations while potential enemies were quietly making improvements to integrated air defense, electronic warfare, cyber, and space capabilities, said Maj. Gen. Maria R. Gervais, deputy commanding general, U.S. Army Combined Arms Center. Gervais spoke during a panel discussion at the Association of the U.S. Army’s Hot Topic forum on Army Aviation. Combat training centers (CTCs) are transitioning from a “counterinsurgency mission rehearsal type environment” and are implementing more large-scale combat operations that include “decisive action training capabilities,” Gervais said. As capabilities from near-peer strategic competitors continue to increase, there is a need to refine training in support of the aviation community, she said, adding the CTCs are stepping up aviation and air defense training. An integrated air defense capability at the CTCs is changing the way aviators fly, Gervais said. “It is driving the change to our culture,” she said. Aside from improving the CTCs, the Army is looking for better ways to develop a soldier’s home-station training capability, Gervais said. She currently serves as the simulated training environment, or STE, cross-functional team lead with U.S. Army Futures Command. Currently, the Army’s live, virtual, and constructive training capability is limited to 10 locations, she said. Today much of the integrated training environment is actually operating on 1980s and 1990s technologies, Gervais said, explaining that limits training functionality. “[Each piece of technology] was individually developed, stove-piped, and proprietary, and right now we have 57 different terrain formats,” she said. “All of these different simulators use terrain differently. For example, training officials recently developed an air defense capability to challenge aviators during simulation training, Gervais said. However, since each simulator operates through a different “game engine,” each system sees and uses the terrain differently. For instance, as aviators navigate through one training scenario, differences between software allow air defenders to shoot targets through hills, she said. To help remedy such problems, the STE cross-functional team is working to develop 10 different terrain formats to meet Army Chief of Staff Gen. Mark A. Milley’s request, Gervais said. So far, the CFT has delivered three. Over the next two years, the CFT is driven to produce an STE that can support large-scale combat training operations. “We’re already demonstrating some level of this capability,” she added. In addition to the improvements made to the live, virtual, and constructive environment, training officials are working on modifications to Army aviation doctrine and training manuals to reflect the shift in large-scale combat operations, said Col. William A. Ryan III, deputy commanding officer, U.S. Army Aviation Center of Excellence. The aviation branch is returning to fundamentals of flight to prepare the warrant officer corps better, Ryan said. “Our soldiers are our most important capability,” said Chief Warrant Officer 5 Joseph B. Roland, chief warrant at the Aviation Center of Excellence. “If we have a piece of [equipment] our enemy can figure out a way to defeat that piece of [equipment]. The one thing the enemy has a hard time trying to defeat is a “Soldier that’s properly trained, that’s innovative and adaptive,” he added.